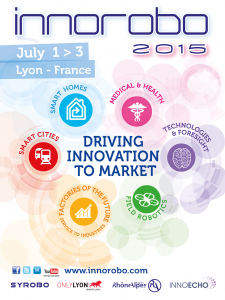 This year Active8 Robots has decided to exhibit at InnoRobo 2015 in Lyon from 1/7/2015 – 3/7/2015. We’re taking a range of our robots including Baxter and NAO as well as some exciting new products which we’ve been working on for the last few months. We’re on stand A56, opposite Rethink Robotics and we’ve got a fantastic range of demonstrations and a fully interactive stand so come over and say hi! There are a whole range of workshops and conferences on during the 3 days including smart homes, field robotics, technologies and foresight and smart cities. A full list and schedule of events can be found at www.innorobo.com. Rodney Brooks, the founder of Rethink Robotics is also giving a keynote speech on Thursday as to how collaborative robots are changing the landscape of manufacturing and logistics across the world. We’ve also got a few spare day passes available so if you’re interested in coming to InnoRobo and haven’t already got a ticket, send us an email to [email protected] and we’ll see what we can do.